This is a rustic French tart with a rather fanciful name, galette, but at the end of the day it is just a pie without a plate. It is simple to make and imperfection is part of its old world charm. 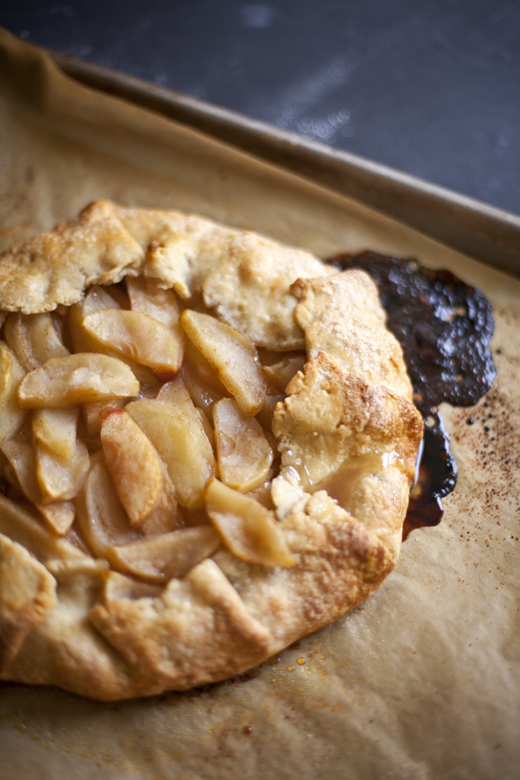 No fancy fluting or lattice top crust to worry about and yet the flavor is just as wonderful. 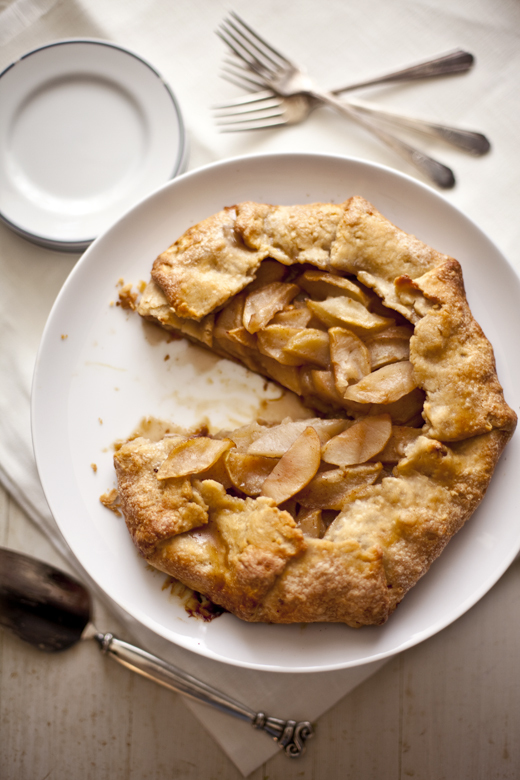 A galette can be made with any filling, but right now the apples are abundant and calling me. Since there are so many varieties of apples available, I like to use a few to create the filling. Some will turn to sauce (McIntosh), some will keep their shape (Prairie Spy), others will be sweet (HoneyCrisp) and some will be tart (Haralson). You can mix and match to suit your mood. 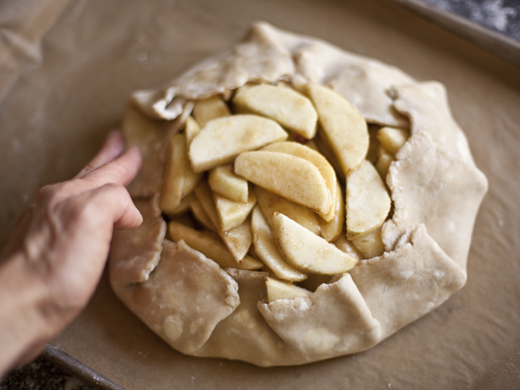 The crust should be tender and flaky and just barely strong enough to hold up to the apples. It adds to the drama if some of the juices escape, which is why we bake on a sided baking sheet. 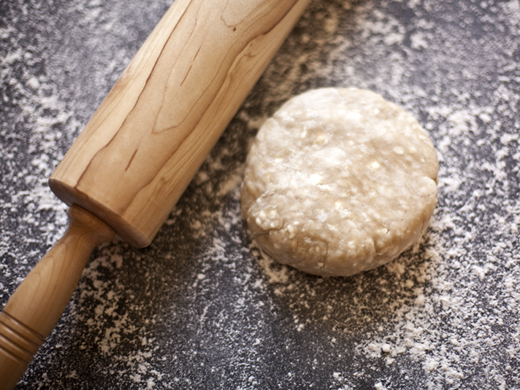 On a floured surface, roll out the chilled pie dough. It should be 1/8-inch thick circle. 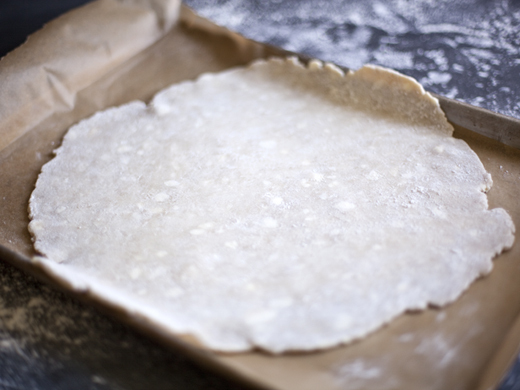 Dust off any extra flour and lay it on the parchment. 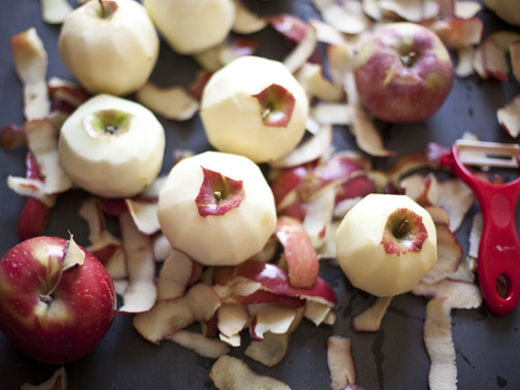 Toss together the cut apples, sugar, salt, cinnamon and zest in a bowl. Pile the apples in the middle of the dough. Fold the dough up, so it covers at least 2 inches of the filling, more is ok.
Brush the edge with egg wash and dust generously with sugar. Bake for 30 minutes, then turn the oven down to 350°F and bake for an additional 30 minutes. 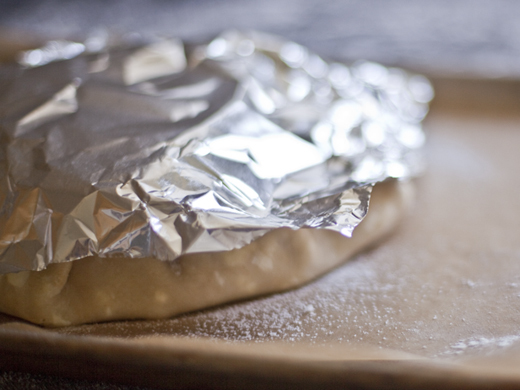 Remove the foil and bake for about 10 more minutes. I adore the rustic charm of galette.. and the best part.. sticky juices that overflow or leak out and then stain that beautiful pastry!! Love the look of the galette. So delicious and inviting. Gorgeous! 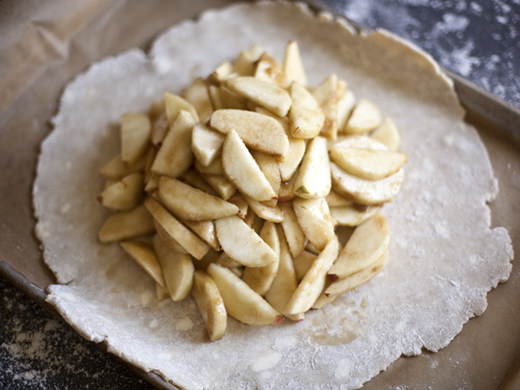 I’ve been all about the galettes lately, will have to try an apple one soon. Never thought about tenting it while baking, thanks for the tip! This is one of the first baking blogs I read many moons ago, and gave me the courage to make my first buttercream and got one of my most delicious cake’ recipe (The Ultimate Carrot Cake)..have since tried 7- 8 versions of it, and like Carol Bloom’s recipe you posted BEST! Just wanted you to know ‘ve finally started my own Food and Life Blog and you’ve been such an inspiration…thanks for the lovely posts and detailed step by step instructions with photos. That is so exciting, congratulations! Have fun with it and please share the address with us! Its http://www.flavorrules.in, just hit off last month on…thanks for your kind words.. I found your site through my daughter and have tried your “Not Your Average Devil’s Food Cupcakes” (which are delicious I might add) and was wondering if the amount of confectioner’s sugar in the icing could be a miss print. I found that if you used 1 cup of confectioner’s sugar as the recipe indicates the icing was too runny. But if I used 1 lb. it was much better. 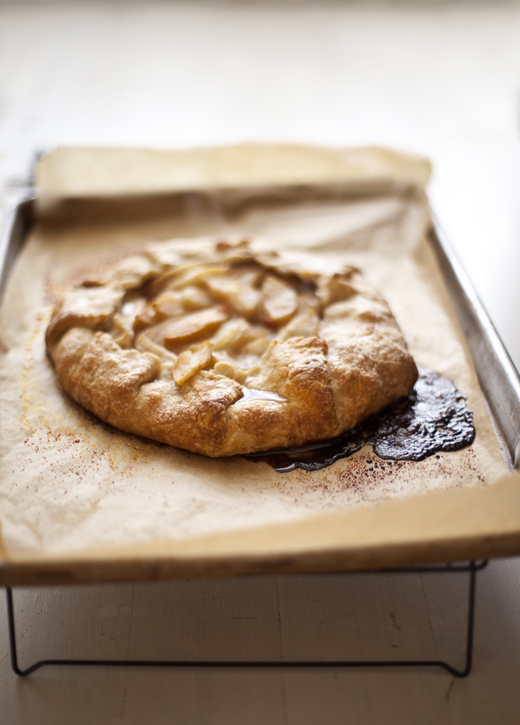 Will also try the apple galette when my husband returns from out of town. 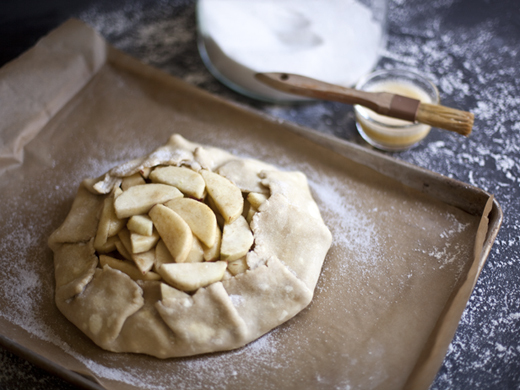 There’s nothing like a rustic apple tart on a fall day. Start boiling the water – a cuppa would be great with this. I love the rustic look of galette’s but what I hate is that they almost always leak making it difficult to remove from the parchment. Next time I’ve decided to spray my parchment to see if it releases easier. Have you found another way that works? I do think greasing your parchment will do the trick. The other thing that helps is to remove the tart from the parchment before the juices start to sieze up and stick or turns to hard caramel. I just finished the Apple Galette and it is delicious. After reading some of the comments and using my own experience with galettes I have found that if you add just a bit of flour (not much) it helps soak up the juices. After doing this I have found that my galettes do not leak nearly as much and most times not at all. Hello Zoe, I baked your Apple Galette for Thanksgiving Dinner with my family. It went like hotcakes. Everyone loved it. It was not to sweet and the lemon zest really hit the mark. It will not be a tradition for us during the holidays. I live and am from Ruston, La the home of the Mitchum Peaches and Pop’s Blueberry Patch both of whom grow the biggest fattest peaches and blueberries you have ever had. As soon as the season comes I am going try both of these in the galette. I bet they will be fabulous. I am so excited about finding your site. I really love it. All of your recipes I have tried have been just great and fairly easy. However, I have a question for you. What is the difference between pie crust with and without eggs. Some recipes call for them and others do not. Anyway I love your site and recipes. Sorry about the mistake. It will be a tradition in my family. Very sorry about the misprint. So glad you enjoyed the galette! This is exactly what I’ve been looking for – simple, delicious and easy. I’m adding it to my meal plan for Monday – thanks for sharing!! just wanted to know since apples vary in size, is there a rough cup(s) or gram measurement to how much sliced apples i should use? This looks fabulous! Love anything that is so rustic and dreamy! Will this work with frozen apple slices? I have some left I’d like to use before this year’s batch. I’ve never worked with frozen apple slices, so I am not sure. I bet they break down a bit when thawed and release some of their liquid, so you’ll need to keep that in mind when using them. Let me know if it works. Thanks for the feedback – I thought of the same concern…so will keep the apples for another use. I make galettes often especially when peaches are at their best. For the apple I pop a scoop of ice cream OR make a brown sugar sauce to drizzle over. Thanks for your terrific blog. Just made your apple galette for the first time and I have to say it is amazing. I did add a bit of all-spice to the apple mixture but other than that it turned out well following your instructions. Will definitely be making rhis again. May even make some caramel sauce to drizzle over it. Thanks for sharing this wonderful recipe. I bake this galette for Thanksgiving and it was delicious so thank you very much for the recipe and the pointers! I am so thrilled you made it! In my previous post, I wrote “bake” instead of “baked”; sorry, I didn’t know that I was OCD until I typed this…LOL!